Didn’t Descartes make a similar claim? And some people still take him seriously. Whaddaya want from a dude who crawled into an oven to come up with the Discourse of the Method? An oven, I tell you! That was the tip-off for me! Just wanted to say that I love your strips, please do not stop, they are amazing and always make me think and smile at the same time. Begs the question, if the atheist authors read each others’ (or indeed, their own) works, does that shake their belief in themselves? I can get behind the idea of an alternative viewpoint, like Michael Moore making a wholly left-wing film to balance out right-wing media coverage in the US, but aren’t alternative viewpoints just unshakeable sureities in a world of tenuous uncertainty? 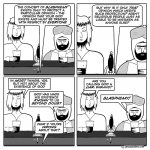 I suppose I’m a practising (and probably preaching) atheist but the certainty thing is not the point. I am certain that I donÃ¢â‚¬â„¢t believe but I will not say for certain that god does not exist, cos I donÃ¢â‚¬â„¢t know. Whereas your committed believer will also demand that godÃ¢â‚¬â„¢s existence is true fact. Btw Ã¢â‚¬â€œ the main problem with all the great comments from people to this exceptional site is that it is now taking me even longer to get out in the real world! I hadn’t heard about the oven before. Charles Babbage went into a blast furnace with, if memory serves, another man and a dog. There are many, many big names in philosophy who have or had some “belief in a God”. 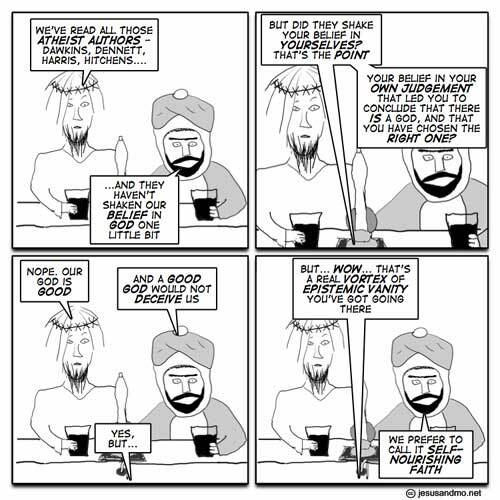 This belief can be rationalized, so you can’t point belief as stupid… as for belief on a specific religion… well that’s another subject entirely. You forgot the one who isn’t willing to talk about god before the term is defined. The existence question is only answerable if we know what we mean by god. As long as the word is just thrown in a conversation there can be no real talk about it. Topi, there’s yet another kind of being, the people who really don’t care, who just want the religious guys to stop bothering us. All of them. Forever. I recognise that laws and regulations can often be good things, they tend to prevent strong guys from beating me up and stealing my ice cream cone but being burnt alive for washing my bum with my left hand just because some dimwit pretends his imaginary friends whispered that one into his ears just never seemed logical or reasonable. I am probably technically an atheist but I’m more of a devoutly zealous apathetic. I don’t care whether there are gods, though I know there are not, so long as beer tastes good, bacon is on tap and my house is warm. 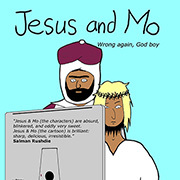 Hey-Zeus and Mo’, I’m pretty sure that few if any “atheist authors” bother to write books to convert you two, or any of your vicars-on-earth to the side of the Army of Light and Reason, we know a futile effort when we’ve banged our heads against it. We tend to do it to prevent us from losing the young and impressionable to your Legion Of Darkness and Hate by us getting to them first and best. Protecting the young is important. It prevents them from swelling the ranks of suicide bombers which is always a good idea. We do it for that reason and because we like to hear our own voices and to make money. Making money is also quite important.